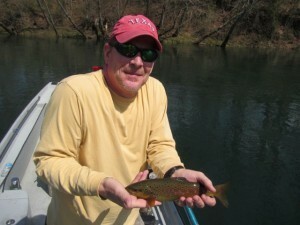 David is from Keller, Tx and yesterday was his first trip to the Little Red River. He is somewhat of a streamer junkie and is well traveled and an accomplished fly fisher. We had a sunny spring morning and the COE is currently running one unit of generation around the clock as Greers Ferry Lake continues to be four feet above the conservation pool. We spent the morning working hard with a couple of streamer patterns and David turned a couple of nice fish early during the float including a really good colored up Rainbow that just slammed the streamer. Mid morning we made a switch to a nymph rig and picked up a couple of Rainbows on Bo’s Missouri River Worm pattern. 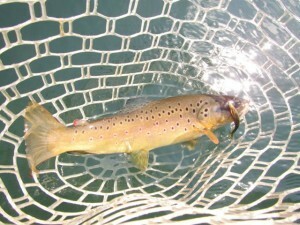 After lunch the streamer bite picked up a bit and we got a couple nice Brown Trout to the net on an olive and yellow Chuck’s Chunk and turned four other fish one of which was a real stud. We finished up the day back on the worm pattern and few more Rainbows on a #14 Original Ebbie. We have rain in the forecast for the rest of the week and into next week so river levels should continue to be favorable for streamer fishing. No doubt Dvid will be back with his streamer rod looking for that big Brown Trout that he missed yesterday.